New York stands with Ahed Tamimi | Fight Back! 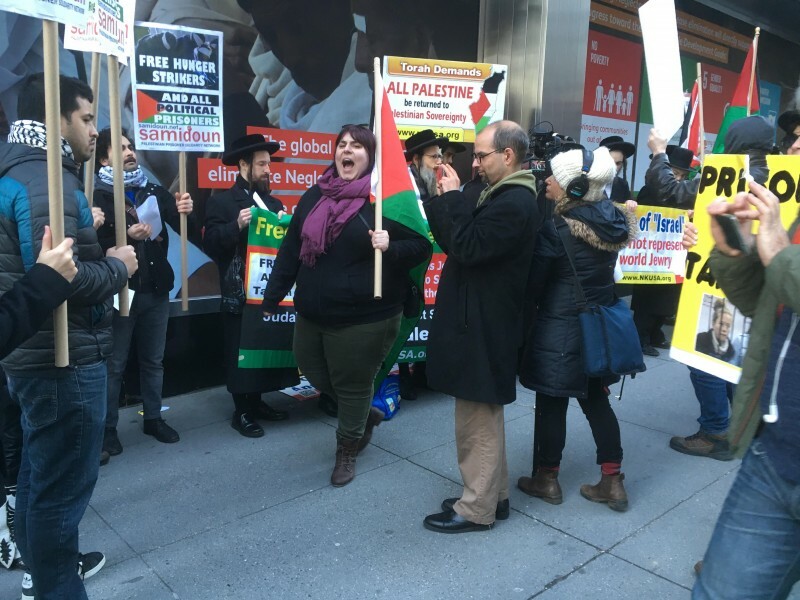 New York, NY - About 40 activists gathered outside the Israeli Consulate on the afternoon of Feb. 18, as a part of the national day of action in solidarity with the Palestinian girl, Ahed Tamimi. On Dec. 19, 2017, when Ahed Tamimi was 16 years old, she was arrested by Israeli occupation troops in the middle of the night. The charges against her was that she had slapped an IDF soldier while attempting to defend herself, her family and her country. Along with Ahed, her mother, Nariman Tamimi, was arrested later that day when she went to ask about her daughter. On Jan. 11, Mohammad Tamimi (Ahed’s cousin) was arrested from his home. On Jan. 22, her brother, Osama Tamimi, was also arrested. With each arrest it becomes more clear that Israeli forces are targeting the militant and brave Tamimi family, who are known for leading protests in their hometown, Nabi Saleh. Currently, all the Tamimis who have been arrested are still incarcerated. Ahed Tamimi is facing trial as she is one of the hundreds of Palestinian children detained and imprisoned in Israeli prisons. The New York activists strove to ensure that passersby and attendees understood the importance of supporting Ahed Tamimi. While the pro-Palestine activists were chanting, they were faced with pro-Zionist forces - a smattering of members from the Jewish Defense League (JDL). Despite the JDL, the spirits and resolve to stand in solidarity with Ahed Tamimi and her family remained strong. 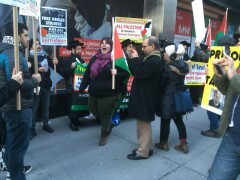 The protest was called for by the Samiound Palestinian Prisoner Solidarity Network and attended by different organizations from the NY4Palestine coalition, such as NYC Students for Justice in Palestine.